As legislators, lobbyists, and stakeholders turn their attention to preparing bills for the 2016 legislative session, many may wonder, “Is this really a new idea, or has someone tried this before?” Or maybe someone’s looking to strengthen an existing statute and wondering, “When did they first pass this statute, and has it always had these problems?” The answers to these questions are easily found with just a bit of research. The key is knowing where to look. Every bill introduced in every regular and special legislative session since 1997 is available on the General Assembly’s website under “Session Information – Prior Sessions.” The bills are organized by year, and the database of each year’s bills is searchable . You can also search for a keyword or phrase by clicking “Search” near the top of the page. A legislator may also ask a drafter to search the OLLS database of bill and resolution titles, which goes back to 1999. This search identifies bills and resolutions that included a particular term or phrase in their titles. Just knowing whether a bill has been introduced to address your topic is not enough. It’s also helpful to know how the bill was amended, who testified for or against it, what issues were debated, and whether the bill passed. This information is also available, but it takes a bit of digging. The third reading vote tallies for the bill. When you click on the third reading vote link, it takes you to the House or Senate Journal page for the day on which the House or the Senate voted on the bill on third reading. You may need to scroll through the page to find the bill you’re looking for. 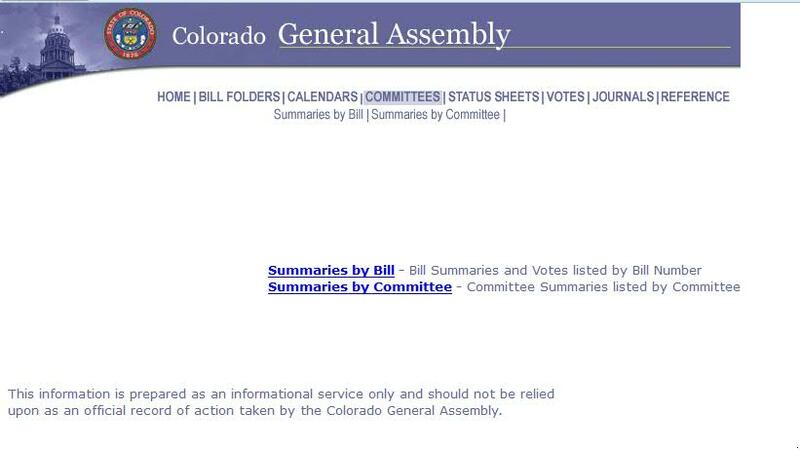 To find a summary of a committee hearing on a bill, click “Committees” at the top of the page. Next, click “Summaries by Bill,” then select your bill, and you will see the bill summaries for each committee of reference that heard the bill. Click “Bill Summary,” and you will see a short summary of the bill discussion, any testimony provided on the bill, the amendments that were offered, the vote tally on each amendment, and the final vote tally. Each bill summary also shows the date of the committee hearing and the times at which the bill sponsor spoke, witnesses testified, and the committee took action on the bill. This is important information if you want to listen to the testimony or debate. The state has recordings of committee hearings going back to 1973. To get a recording of committee testimony and debate, contact the Legislative Council Staff at 303.866.3521. To listen to a committee hearing before 2002, you must contact state archives. You may also be able to watch or listen to the floor debate on a bill. Use the bill history to identify the date on which a bill was considered on second or third reading. 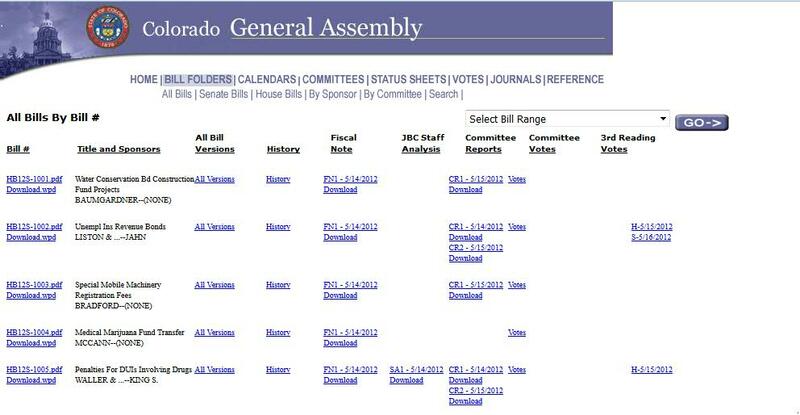 Then, on the General Assembly homepage, click “Audio and Video Broadcasts” under “Session Information.” Then click the Colorado Channel home page link, click the button for archived legislative sessions, and follow the directions. Unfortunately, the video and audio recordings of floor sessions only go back to the 2010 session. If you want to know when a statute was originally enacted and how it’s been changed since then, you must check the statute’s source note. Every section of the Colorado Revised Statutes has a source note immediately following the text that indicates the year the section was added, any year in which it was changed, which provision of the section was changed, where in the Session Laws to find the bill that made the change, and the effective date of the change. For more of the specifics on interpreting source notes, see page vi at the beginning of each printed volume of the Colorado Revised Statutes or check out this memo on the OLLS home page. There’s also a very handy chart for decoding source notes. If the source note tells you that your section has been amended, use the reference to the Session Laws to look up the bill that amended the section. For example, if the source note says “L.2015: (1)(c) amended, ch. 12, p. 27, §1, effective March 31,” open the 2015 Session Laws of the State of Colorado to page 27 and you’ll find the bill that amended the section. Or open the 2015 Session Laws on-line through the General Assembly website and click on chapter 12. Since 2009, the legislative editors in the OLLS have also included in each source note the number of the bill that adds, amends, or repeals a statute. If you’re checking the statutes on-line, the bill number is hyper-linked to the bill itself.